As we are spending more time outside and curb appeal season is ramping up, let’s talk about these seven tips for keeping your yard green without doubling the water bill. 1. Determine whether the type of grass in your yard is the best variety for your climate. There are dozens of unique classifications of turf grass, and all varieties respond differently to their environment. 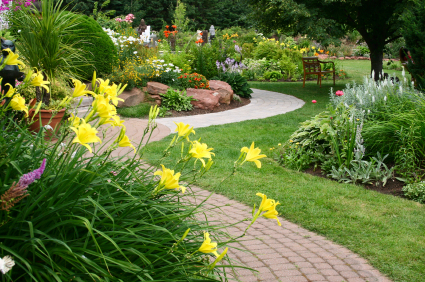 A few basic examples are cold- or heat-tolerant, saltwater-tolerant, grasses that stand up to wear and tear. Start by asking a lawn expert what you have (be prepared to discover there are several kinds) and which is the easiest to keep green. 2. Mow it at a higher setting. The blades on grasses act like satellite dishes for the roots. They attract sunlight, convert the energy into food and feed the roots. Raising the height on your lawnmower will prevent damage to the crown (just below the green part) and give the grass a bigger receptor to the sun’s energy. 3. Pick the best time to water. On hot summer afternoons, water evaporates quickly, so it will take more water to saturate your lawn then than at other times during the day. On average, 5:00 a.m. is the best time to run the sprinklers or hose. 4. Go with a rainwater collection system. Rainwater collectors don’t have to be fancy — some are in the shape of barrels — but they do help cut back on the water bill while keeping your yard healthy. But if you want to go fancy, there is a company that makes a system that doubles as a fence. 5. Prevent disease by applying the appropriate chemicals. Grass blades are susceptible to disease, like any other living organism. If you notice brown spots in a somewhat regular pattern in your yard or mushrooms in a circle, that could be a symptom of a fungus. The fungus could spread and possibly destroy parts of your lawn. An expert can advise you on what is appropriate for your variety and environment. 6. Fertilize it. Healthy yards stay green longer, are less prone to contamination and recover from foot traffic better than their counterparts. Feeding your grass is one way to keep it healthy. Going back to number 1 on this list, determine what you have in your yard and buy the appropriate fuel for it. You’ll see the blades grow faster and thicker when properly nourished. 7. Overseed it in the fall or winter. This strategy applies mostly to folks who live in mild or warmer climates, but cold-weather lawn-lovers can overseed as well. Overseeding means just that — seeding over an existing yard. You’ll have a green yard in the winter, but those seedlings will also help insulate your existing grass.